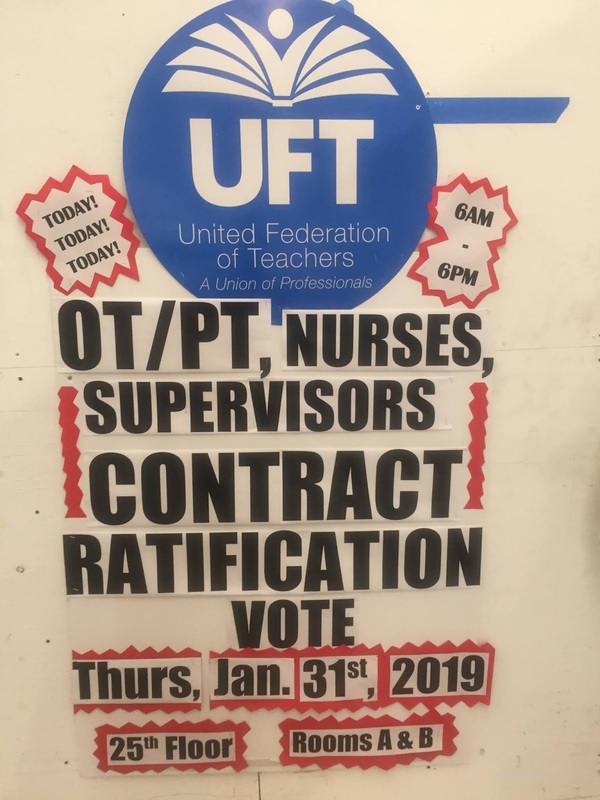 The results are in: a new contract was ratified by United Federation of Teachers-represented occupational therapists (OTs) and physical therapists (PTs) who work for the NYC DOE by fewer than 100 votes in a department that is 2,700 strong. 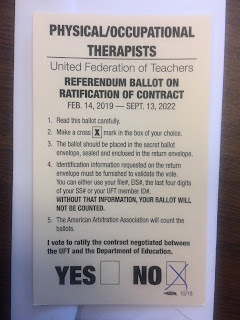 The OTs and PTs For A Fair Contract campaign was opposed to ratification because it makes little improvement to our working conditions, which are our student’s learning conditions. Our demands for parity were not met because we will still earn significantly less than our colleagues in the special education department including speech therapists, counselors and social workers. Our educational differential, or the income earned for receiving a Masters or Doctorate degree, is $5,000 short of what teachers and speech therapists are granted. Therapists hired after September, 2019 will be placed on a track to senior status that will be 4 years longer than at present. That’s 4 more years with a salary that can hardly keep up with the cost of living in New York City and the costly price of post-graduate level college debt. While we serve students with disabilities, we are still not given, in legally binding terms, the right to receive benefits under the Family Medical Leave Act to care for a loved own should a disabling condition impact them. To the city’s credit, a clause in our contract will attempt to correct this inequity through establishing a committee to encourage and ensure leaves. Our demands for resources were not met because we were not provided, in legally binding terms, access to an appropriate work space. The Blue Book formula which articulates required space utilization in schools does not ensure an appropriate setting for occupational and physical therapy. Children with disabilities should not be receiving therapy, or any other kind of academic instruction for that matter, in hallways or rooms that are otherwise used by multiple groups of people, with multiple activities co-occurring, as a standard operating procedure. When schools are co-located, as often times they are, therapy rooms are the first to disappear and be converted into offices for more administrators. That common practice leaves children, their teachers and related service providers in a substandard setting (i.e. basement, boiler room) or sometimes none at all (i.e. hallway, lobby or vestibule). Not having a consistent, appropriate space in which to provide services and teach is a travesty of justice that is nothing short of institutionalized discrimination against students with disabilities. Our demands for respect were not met. We are dedicated, direct service providers for children with disabilities and yet, we are not worthy of enforceable access to the benefits afforded under the FMLA. We were given contractual clauses that pledge to form committees to address resource and benefit shortfalls that our campaign has raised. But without legally binding terms, this set of toothless, unenforceable clauses is insufficient. We ask ourselves what kind of contract the families we serve would want. Would our contract be satisfactory to families of children with disabilities? We will continue to advocate for our professions, our children and our right to equal pay for equal work. We are mostly women; we have children of our own; we have disabled children of our own. We know this fight is bigger than us and that it is vital to continue. Despite our criticisms, we are public school proud and union proud. We believe our efforts can raise the standards within the institutions we hold dear when it comes to respecting the needs of children with disabilities and those who work to see them flourish. The key to bringing about the changes we envision is an activated membership and a union with transparent procedures that encourages membership involvement and initiative.